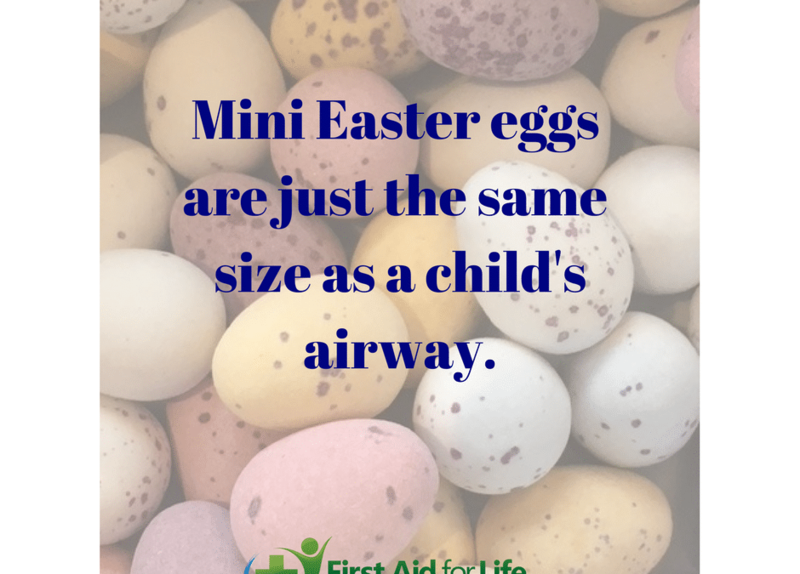 There has been a lot of talk in the press recently about the dangers of children choking on smaller Easter eggs. As such, we decided to raise some awareness of the issue – and the response we have had been amazing. It just shows how interested people really are in accident prevention and staying safe. 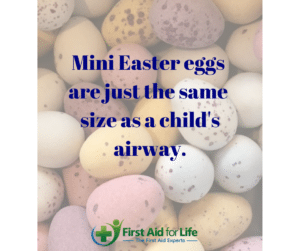 Read on to learn a top tip to help keep children safe this Easter. The story came about after a mother shared her story about how her daughter choked on a mini egg several years ago. Her story is a stark reminder of just how easily small, round foods can become a choking hazard for young children. For years now, we’ve known that grapes are potentially very dangerous for young children. As a result, many schools and nurseries across the country have now banned children from bringing them in as part of their packed lunch. Mini Easter eggs are now being flagged as a danger too. Parents are being advised to either buy larger, hollow eggs that are less of a choking hazard – or to supervise their children much more closely when they are eating them. Please don’t panic though. Although choking is very common and extremely frightening, it is still comparatively rare that it proves fatal. 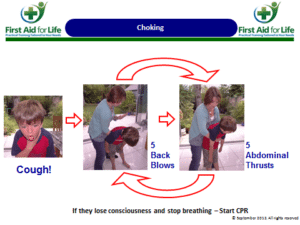 See below for a full guide as to how to help a choking child. 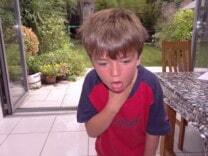 Or click here to take our free online first aid course on choking. Babies and young children can choke on anything small enough to fit through a loo roll. To prevent choking, keep small objects out of reach, cut food into very small pieces and always supervise children when eating. Remain calm and encourage them to cough to clear it themselves. Perform 5 back blows – Bend the child forward, supporting them on their chest. With the other hand give a firm back blow between the shoulder blades. Check to see if the blockage has cleared before repeating. Stand behind the child and place one hand in a fist under their rib cage. Use the other hand to pull up and under in a J shaped motion, to dislodge the obstruction. Perform abdominal thrusts up to 5 times, checking each time to see if the obstruction has cleared. Anyone who has received abdominal thrusts should be seen by a doctor. Never perform abdominal thrusts on a baby, use chest thrusts instead. Keep going and alternating five back blows and five abdominal thrusts until emergency help arrives. If at any point the child becomes unconscious, commence CPR. We hope you will not need to use this – but it’s always best to be prepared, not scared! It is strongly advised that you attend a Practical First Aid course to understand what to do in a medical emergency. Please visit www.firstaidforlife.org.uk or call 0208 675 4036 for more information about our courses. Cold Water Shock can kill! What is it and how to help?